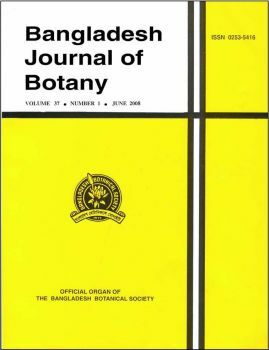 Bangladesh Journal of Botany is the official organ of the Bangladesh Botanical Society established in 1972. Full text articles available. The Bangladesh Journal of Botany is NOT accepting online submissions so even if you register with the journal, you will not be able to submit online. In vitro slow-growth conservation for two genotypes of Solanum tuberosum L.
Insecticidal activity of essential oil from seeds of Poncirus trifoliata (L.) Raf. Antioxidant, anti-urease and anti-elastase activities of Usnea longissima Ach.